I'm not a fan of Beaujolais Nouveau. It's silly to see the world go nuts over an overpriced, overhyped barrel sample. Nonetheless I have tried it almost every year for the last decade, frankly to confirm my prejudice against it as much as anything. 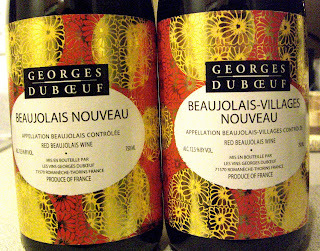 The importers of Georges Duboeuf don't pay close attention to which American wine writers like Beaujolais Nouveau. So they keep asking if I want samples, and I say yes every year, even though I've never written a single nice thing about it. Until now. This year is an excellent year for Beaujolais Nouveau. The reason is weather -- it was a warm, dry summer in most of France. Burgundy and Bordeaux vintners are both delighted over their vintage. Most people don't realize this, but Beaujolais is actually part of the Burgundy wine region, so it's no surprise Beaujolais had an excellent year. The warmth translates into Beaujolais Nouveau that is a little riper than most years, and thus friendlier to American palates. I usually think Beaujolais Nouveau tastes like underripe, slightly sour plum juice. Not this year. I think you can project from the surprisingly good Duboeuf wines to the entire spectrum of Beaujolais Nouveau producers. Duboeuf, the biggest name, buys the most grapes and thus actually has the least control over the final product. If its basic level Beaujolais Nouveau is this good, it really is a great year for the stuff. 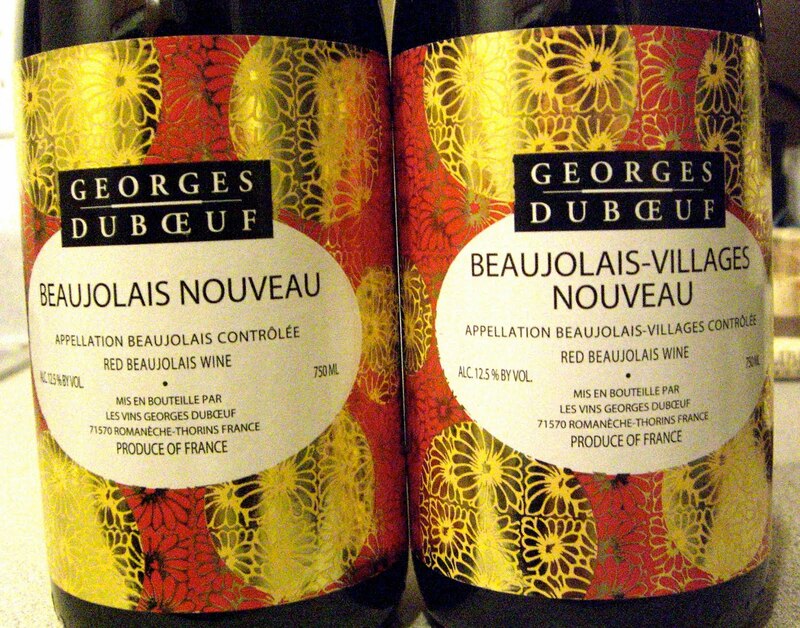 Duboeuf's Beaujolais-Villages Nouveau is really worth the extra $1; at $11, it's fantastic value, a good wine where normally I expect a gimmick. I feel grudging saying this, because it's a big part of the US marketing campaign, but these really are great wines for Thanksgiving dinner. They're light-bodied, low in tannins and refreshing, and won't conflict badly with the menage of flavors on your plate. And philosophically, they're this year's harvest, so they're something to be thankful for. Don't overpay, don't overrate, and don't overexpect. All of that said, I nearly finished an entire bottle of the Duboeuf Beaujolais-Villages Nouveau last night, and nothing I can write speaks as eloquently of my opinion as a lot of empty glasses. It's pretty funny that they keep sending you samples despite your bad reviews. My experience has been much of the opposite, if I receive a sample I'm getting phone calls/emails within a week to see when the review is going to be written, or at least for me to tell them what I thought. Glad to hear they've broke you down, better quality wine all around the past couple of vintages it seems. Thanks for the report and I am happy to hear that this year's Beaujolais Nouveau is decent and will go well with Thanksgiving dinner. Whenever I host a Thanksgiving dinner here in Japan, invariably half of the guests will bring some craptacular Beaujolais Nouveau purchased at their local 7-11. For that reason alone, I was thinking about *not* making turkey this year. Maybe I will stipulate that if they feel they have to bring BN, it should be the GDB-VN. Mark: Sometimes I get those, but I don't always respond. I'm a bad boy. Look on the bright side, Guren, at least Japanese 7-11s stock current-vintage BN. I've seen year-old BN sitting in some liquor stores -- a year-old barrel sample. Jake: I don't disagree with your points. Since I already emptied my bottles, I won't be drinking BN on Thursday either. I didn't comment on the absurd prices at some events I've seen posted online -- one place was charging $95/plate with $40 for BN wine pairings. That's four bottles of BN at retail! Who can drink that in one sitting?